Properties in Stratford Country Club average 4.6 out of 5 stars. Property 6: Self contained, 1 bedroom flat in downtown Stratford. 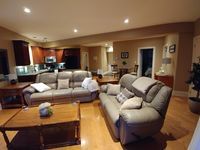 Self-Catering Suite (Mitchell) - near Stratford, Ontario. Property 8: Self-Catering Suite (Mitchell) - near Stratford, Ontario. Property 10: Awaken to nature’s beauty at Whispering Pines Retreat! 2 bedroom home, steps away from the town centre, theatres, restaurants & river. Property 13: 2 bedroom home, steps away from the town centre, theatres, restaurants & river. Property 22: Resonance Residences on the 2nd floor of a Historical Building in downtown Stratford. A Vintage Modern Home, perfect for all! Property 30: A Vintage Modern Home, perfect for all! A charm of a home, modern interior with gorgeous finishes! Property 40: A charm of a home, modern interior with gorgeous finishes! Property is very well kept, easily accessible, communication from owner great. Only downsides, both bedrooms are situated by fairly busy road even late in to the night so there is road noise. Other downside, blinds are thin paper blinds and let a lot of light in to the bedrooms at night. This basement apartment was a great place to stay in Stratford. The location was perfect. We drove into the downtown area but you could easily walk and it would be a nice stroll. The apartment was bigger than I thought it would be. Lots of natural light comes in through the big windows. The space is well kept and maintained. The furniture in modern and well looked after. The couch is very comfy. The kitchen has everything you need for cooking full meals or just having a light snack. It was convenient to have parking included as well.